Best pediatrician Dubai: Diploma in Child Health (DCH) is a postgraduate diploma course of 1-year duration which deals with the care of infants, children and also adolescents at the community level as well as at primary and secondary levels of health care. A person with an MBBS degree can get admission into this course. It is a step below the MD pediatric degree. I did it along with my MD. I got a Gold Medal for standing first in my batch for the exam. The diploma is similar to certificates and is often awarded through community or technical schools. They are usually shorter in length as compared to degree programs. For example, an MD is a degree and took longer and is from Bombay University. Both can be taken after 5 years of MBBS. Some doctors ended up doing only diploma but most of us went on to do an MD degree. 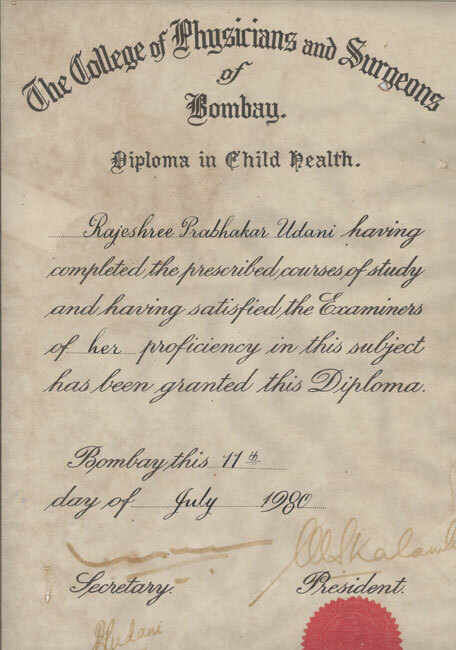 The Diploma was offered by KEM Hospital and many saw it as a practice for the MD exam which was seen as being really difficult. DCH also had both written and practicals. DCH is designed to give recognition of competence in the care of children to a general practitioner or for senior house officers in pediatrics. We used to go for lectures in the auditorium that was close to the hospital. There were some great small cafeterias along the way. There was one that was my favourite. It was called ‘Irani Chaiwalla” or teashop. They served the best masala chai latte with ‘makhan bread’. It really helped to sit for the diploma as it was a good training and rehearsal for the final exam. Doctors can practice pediatrics with a diploma but the MD degree is superior. For those who have an interest in paediatrics, I would strongly recommend attempting this diploma. It not only helped me consolidate knowledge gained during paediatric training, but it also helped me focus and develop skills needed for the examination of children within primary and secondary care.